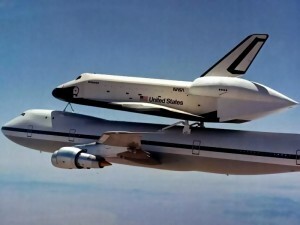 The first Space Shuttle orbiter, the Enterprise, embarks on its maiden flight in “captive mode,” attached to the top of a Boeing 747 jumbo jet. The flight is the first of five captive flights before the orbiter is finally released to land on its own. The nine month test program is conducted through November 1977 at the Dryden Flight Research Facility to demonstrate that the orbiter can fly and land like an airplane. The Enterprise, while the first shuttle to fly, was not the first space-worthy orbiter and was only used for testing purposes.